AMD continues to step up its CPU core game. Today the company announced its new EPYC server line-up, codenamed Rome, that scales up to 64 cores and 128 threads. This opens the possibility for AMD's enterprise customers to equip a single dual-socket motherboard with up to 128 cores and 256 threads. 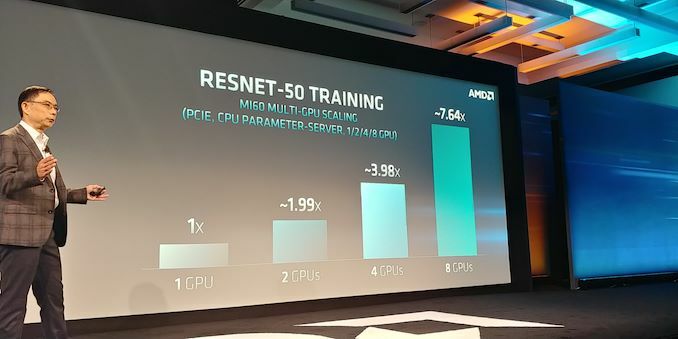 Shortly after unveiling its 7nm Radeon Instinct MI60 and MI50 accelerators at its Next Horizon Event, AMD revealed the company's forthcoming EPYC 'Rome' processors. The new processors are built around the chipmaker's Zen 2 CPU microarchitecture. They feature a new and revolutionary "chiplet" ecosystem whereby a 14nm I/O die sits at the center of the processor, surrounded by four 7nm CPU chiplet modules on each side. The chiplets are interconnected with the I/O die via AMD's second-generation Infinity Fabric architecture. Each chiplet carries up to eight cores and 16 threads. EPYC 'Rome' processors are equipped with an eight-channel DDR4 memory controller, which is now housed inside the I/O die itself. Thanks to this improved design, each chiplet can access the memory with equal latency. The multi-core beasts can support to 4TB of DDR4 memory per socket. They are also the first processors to support the PCIe 4.0 standard and have up to 128 PCIe 4.0 lanes, which make them an ideal companion for AMD's recently announced Instinct MI60 and MI50 accelerators that utilize the PCIe 4.0 x16 interface. However, AMD didn't specify whether the PCIe resides inside the I/O die. It's probably safe to assume that each chiplet has its own PCIe lanes. EPYC 'Rome' processors will work without hiccups on the existing 'Naples' server platform and the future 'Milan' platform aimed at processors based on the Zen 3 CPU microarchitecture. AMD has already started sampling EPYC 'Rome' processors with some of the company's biggest enterprise customers. AMD hasn't revealed the pricing and availability of the EPYC 'Rome' line-up. Nevertheless, the processors are expected to be released in 2019, assuming there are no major setbacks. Just wondering if with PCIe 4.0 will be also get faster m2. SSD drives or it will be the same. Also what other real benefits are coming from PCIe 4.0? pcie should give more bandwith, but current gpus and m.2 still havent reached limit of pcie 3.0 or 2.0 limit yet, in short not even close. Thanks to this improved design, each chiplet can access the memory with equal latency. I don't want equal latency to come at the expense of low latency. The current EPYC architecture provides low latency for local memory accesses, which can be achieved though NUMA-aware apps, OS, and/or VM partitioning. I hope AMD didn't just cede ground on one of EPYC's strengths. The main benefit for consumers (and we still don't know when it will arrive in a consumer platform) will be that you can do more with fewer PCIe lanes. So, splitting your GPU lanes to dual x8 will be virtually painless, as will splitting your M.2 to dual x2 connections. Personally, I'm most interested in seeing full-rate 10 Gbps ethernet on a little PCIe 4.0 x1 card. Yes, they have exceeded what PCIe 2.0 can support, as that's < 2 GB/sec for a x4 link (or a x2 link @ PCIe 3.0). Well I've meant for the x16 lanes, I havent seen or watched around the m.2 and x2/x4/x8 modes and transfer rate, but its good to know. I can imagine the TDP being at least 200 watts under full load. But how much more than that?? I mean, I get 7nm is more efficient than 14nm at the transistor level, but there's also a lot more dies on that package too. Will be very interesting on cooling strategies for a racked up server that uses as few U's as possible. OK, so from this article, you say that the Rome processor will have Zen 2 "chiplets" and PCIe 4.0 lanes. So you are saying that Zen 2 will contain PCIe 4.0 lanes unless the PCIe 4.0 lanes have been moved out on to the I/O processor. If that's the case then the chiplets have to talk to the IO processor via Infinity Fabric 2.0 then to the PCI bus. Seems like that would increase latency. That us the general consessus. There is more latency but separate IO can feed separate cpus more evenly. So you win something and lose something. Intersting to see bencmarks! They did not change the system for no reason! I'm wondering about the cooling of these beasts. That is a lot of cores and threads, if you run BOINC or another platform like that, all cores and threads are in use pretty much all the time. Clock speed is not mentioned.